For some people having to answer to someone else is somewhere close to torture. They cannot handle being someone else’s subordinate, and prefer to always be in control. For others it really isn’t a big deal to answer to someone else, as long as that person treats them respectfully. 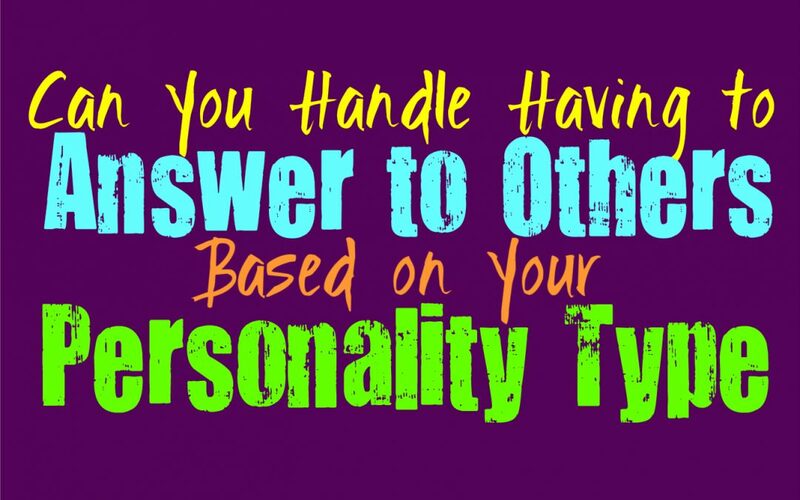 Here is how you handle answering to someone else, based on your personality type. For the INFJ it isn’t so much about having to answer to someone else, but rather about who they are answering to. If the person who is their superior in some ways, is a complete fool then the INFJ won’t handle this that well. Having to answer to people who are rude, immoral or lack intelligence, these things are going to leave the INFJ feeling trapped and completely frustrated. They need to feel like they are dealing with someone who is actually capable of handling the job and who treats others with a sense of respect instead of control. In these scenarios the INFJ will be just find answering to someone else in small ways, but not with anything too major or personal. ENFJs don’t really like having to answer to others, simply because they prefer to maintain a sense of control. This isn’t for selfish reasons, it is simply because they want to be able to provide for and take care of their loved ones. ENFJs don’t like relinquishing control because to them this can put their goals in jeopardy in some ways. They want to feel like they can take care of things and protect those around them. So for the ENFJ the struggle of having to answer to others is simply that they don’t always trust those people to take care of things the right way. INFPs don’t really do well answering to others, simply because they can become too distracted for it. They don’t need to feel like they are constantly in control, but they do need to make choices which are moral and right for them. For the INFP it feels draining to constantly have to answer to someone who is demanding or needs things done in a meticulous manner. They don’t mind being subordinate in some ways, it isn’t about feeling superior, it is simply about having people show a sense of respect and not control. INFPs also feel drained when they have to answer to people simply because the pressure and expectations can feel like too much. ENFPs don’t like answering to people in most situations, simply because they don’t want to feel controlled. ENFPs prefer to do things on their own terms, with a sense of freedom and self-reliance. If they have to constantly answer to someone else they can sometimes become a bit short-tempered with the situation. They will do their best to handle this, but they might have slip ups and find themselves distracted by something else. They are often capable of doing really well in most careers since they are adaptable people, the only problem is having to answer to people who don’t deserve it. INTJs don’t really appreciate having to answer to someone else, since they often prefer to have a sense of control. They are capable of doing their best in situations where they need to climb a business ladder, and so they will try to handle being someone else’s subordinate for a while. INTJs don’t really handle this well long-term, since they want to have room for growth and to work towards a career which gives them independence and freedom. Most INTJs find themselves wanting to work in careers where they don’t actually have to answer to others on a constant basis, since they really do like having space and control. ENTJs sincerely don’t appreciate having to answer to others, and so they do their best to avoid this. They make much better leaders than followers, but that doesn’t mean they aren’t capable of hearing people out. They simply don’t like having to be the one who answers to someone else or has to be their subordinate. ENTJs prefer to be in control at all times, and so they often work towards being in a position where they don’t have to answer to anyone else. This is often a major goal for the ENTJ, which is why they work to climb the ladder, or even find a way to work for themselves. INTPs definitely need independence in just about every area of their lives, so they do struggle when it comes to answering to others. Whether this be in their personal relationships or in the workplace, the INTP does not like having to constantly answer to someone else. When it comes to their careers INTPs often do better when they have plenty of space and independence and room to use their own creative thoughts. Having to constantly answer to someone else is both draining and extremely frustrating for them. ENTPs are capable of appearing like they are answering to someone else, when it truth they will just find a way to do things on their own terms. They don’t like feeling like someone else has control over them, and they can become truly annoyed in these situations. At the same time they don’t want to miss out on something important or a chance to grow in their position, so they often find ways to take back control without it being completely obvious. For the ENTP it can be about playing a certain game in order to get what they want without having to get themselves into too much trouble. ISTJs definitely don’t like relinquishing control, but they are capable of answering to people who are clearly their superior in the workplace. They are respectful and responsible people who simply want to do their job to the best of their ability. This doesn’t mean they don’t intend to climb the ladder and work towards being in a position of more control, it just means they are mature enough to handle having to answer to people. For the ISTJ it is about doing what they have to in order to achieve their goals and provide for their loved ones. ESTJs aren’t really fans of having to answer to others, especially not someone they have little respect for. They often prefer to be in control at all times, and can be a bit combative sometimes because of this. ESTJs will do their best to handle answering to others when they need to, but it is much easier for them if they respect the individual. ESTJs can be somewhat bossy people and so they often prefer to be the one giving the demands and handling the situation from a higher position. ISFJs can often handle answering to others, since they are responsible and practical people. If they are in a situation where someone else in more in control, they will do their best to respond accordingly. They don’t simply answer to people for no reason, but in the workplace they can certainly handle it. ISFJs prefer to keep the piece and maintain a sense of harmony and comfort in their environments. For them sometimes it is the smartest and most practical thing to control themselves and simply answer to someone else when they need to. ESFJs don’t mind having to answer to someone else, they can often overcome this in the right circumstances. They will do what they have to in order to provide for their loved ones and be responsible people. When it comes to having to answer to someone in the workplace the ESFJ will definitely do their best to bite their tongue and get their job done efficiently. There might be times when they slip up though, since they can be a bit combative if someone is not showing appreciation for how hard they work. ISTPs don’t really appreciate having to answer to anyone else, since they are highly independent people. They often want a sense of space in freedom in their lives, and prefer being able to work on their own terms. For the ISTP this sometimes means jumping from one place to the next until they find something that fits their personality better. They aren’t incapable of answering to someone else, they simply want enough space and freedom that they don’t feel like someone is constantly breathing down their neck. ESTPs do sometimes struggle when they have to answer to others, simply because they are independent people. They sometimes have a short fuse when they feel like someone is attempting to control them or micromanage their behavior. ESTPs do their best to answer to people who are their superiors, and try to find a way to handle their communication without sounding rude. The only thing is when the ESTP is working they are often focused and don’t have a sunshiny position. ISFPs are free-spirits and so having to answer to someone else can actually pose a challenge for them. They find themselves easily distracted and struggling to fall in line the way others want them to. ISFPs are also highly moral people who follow their own beliefs instead of wanting to listen to what people expect from them. When it comes to answering to others the ISFP can sometimes find themselves fighting back and might even need to bounce around until they find a job which gives them more freedoms. ESFPs can be somewhat independent people with free-spirits, and this makes it difficult for them to answer to someone else. They might find themselves having to bite their tongue and this can sometimes be challenging. They prefer a sense of space and freedom to do their own thing without someone breathing down their neck. When the ESFP is in a career they are passionate about it often is easier for them to handle answering to someone else.